After sell-out gigs in London, Reading and Chichester earlier this year, funk-soul group Brother Strut head to London next month for a special gig at the O2 Brooklyn Bowl. As Frankly, My Dear has a pair of tickets to give away, it only seemed fair that we gave the boys the recognition they deserve with a review of their fabulous debut album First Strut Is The Deepest. For those that don’t know, Brother Strut are a fabulous funk-soul band formed in 2012 by producer and saxophone player Stevie Jones. The group includes Steve Pearce (bass), Frankie Tontoh (drums), Otha Smith (electric guitar), Melvin Duffy (electric guitar/pedal steel), Andrew Murray (piano) and Stevie Jones (sax), who have collectively worked with some of music’s biggest artists including Stevie Wonder, Elton John, Sting, George Michael and Robbie Williams and have performed on hit records that have sold over half-a-billion copies across the globe. 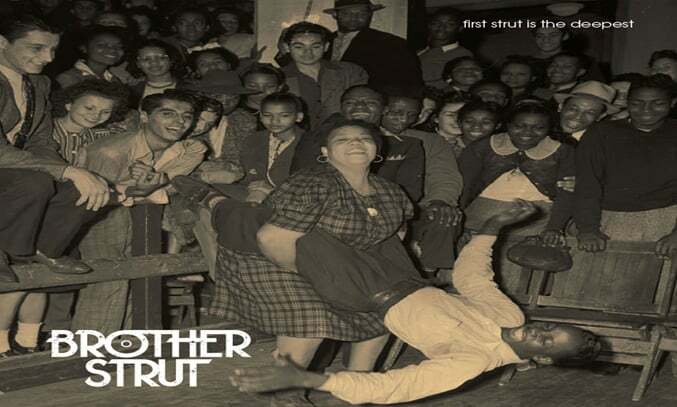 Released on November 18th 2013, Brother Strut’s debut album First Strut Is The Deepest features 11 tracks inspired by funk, blues and American soul music of the 1960’s and ’70’s. The album was co-written with BBC award-winning songwriter Megan Henwood and features five emerging talents on vocals. “The idea was that the musicians were the main focus, so I could chop and change the vocalists from album to album” explains band leader Stevie Jones. And it certainly works. First Strut Is The Deepest is one of the best soul and funk albums I have heard. The album opens with Bags of Funk, a killer funk-soul track with an infectious rhythm guitar riff and a rasping sax solo that is simply brilliant, before moving swiftly into Let The Truth Spill Out, a commercial friendly soul track with a superb horn arrangement and flawless vocals by Sam Tanner. Two tracks that are sure to get you moving are Metropolis, a hip hop inspired track with a fine hook and fabulous sax piece by Stevie Jones and Trolley Dolly, a funk-jazz number with a killer bass from Steve Pearce. Drummer Frankie Tontoh nods to Bernard Purdie on Blind Eye, a smooth and soulful track with sassy vocals from BBC2 award-winning artist and co-writer Megan Henwood. Vinyl Is My Bible is also worth a listen with its fun lyric and catchy vocals by Mike Davies, guitarist and singer for Eliza Doolittle and Jessie J. As the album reaches its half-way point, Otha’s Tune kicks in, a catchy jazz number with an awesome guitar solo from the man it’s named after – American guitarist Otha Smith. A cover of Gotye’s pop hit Somebody That I Used To Know follows, bringing a fresh feel to the pop track with reggage flavours and superb vocals by Ben Lee. Fans of 70s American soul should check out Chicago, with interplay between sax and guitar. Not Your Fool, a gospel/swing number with John James Newman, finalist from The Voice in 2012 is equally brilliant. The album closes with Zaletnik, a beautiful instrumental ballad with Andrew Murray on piano and Stevie Jones on silky sax, a blissful end to a killer album. Fresh, funky and fabulous, First Strut Is The Deepest is a funk, soul and jazz album that fuses elements of 60s and 70s American soul with a modern day flavours. Buy it, you won’t be disappointed! Brother Strut are performing at a special gig at the O2 Brooklyn Bowl in London on 3rd December 2014 and Frankly, My Dear has a pair of tickets to give away. Head over to our Twitter account @FranklyMyDearUK to find out to get your hands on this fantastic prize.